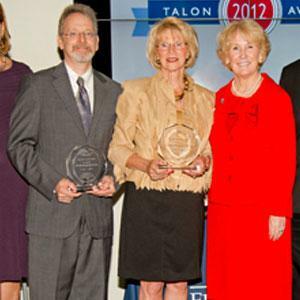 FAU held its annual Talon Awards ceremony as part of Homecoming 2012. Since 1997, the Talon Awards ceremony has recognized outstanding leaders from the community, alumni, faculty and student body constituencies. Co-sponsored by the FAU National Alumni Association (FAUNAA) and FAU Student Government, the ceremony and reception were held at the Marleen & Harold Forkas Alumni Center on FAU’s Boca Raton campus. Honored that evening were The Honorable Susan Whelchel, Mayor of Boca Raton; Stephen Doerr, Senior Vice President, Financial Strategies for Franklin Templeton Companies; Frederick Bloetscher, Ph.D., associate professor in the department of civil, environmental and geomatics engineering; and Stephen Jones, a senior in the Harriet L. Wilkes Honors College. The recipient of the 2012 President’s Talon Award was Boca Raton Mayor Susan Whelchel. A dedicated public servant for nearly two decades, Mayor Whelchel has worked to ensure a strong relationship between the City of Boca Raton and FAU, giving her support to initiatives that included construction of FAU Stadium, creation of the Charles E. Schmidt College of Medicine and ongoing development of the Research Park at FAU. Among the honors she has received in recognition of her outstanding service to the community are the Boca Raton Forum City Official of the Year Award in 2008, 2009 and 2010, and the Rotary Club of Boca Raton Opal Award in 2009. She has served as Mayor of Boca Raton since 2008. The Alumni Talon Award recipient was Stephen Doerr ’87, ’88. The Alumni Talon Award is presented annually to a member of the alumni body to acknowledge leadership, achievement, community involvement and loyalty to FAU. Doerr is Senior Vice President, Financial Strategies for Franklin Templeton Companies, LLC in San Mateo, California. He also has served as Vice President, Finance and Reporting and Vice President, Director of Fund Taxation for Franklin Templeton Investments. Doerr was admitted as a member of FAU’s charter freshman class in 1984 and received bachelor’s and master’s degrees in accounting from FAU. He is a member of the FAU National Alumni Association, a football season ticket holder and a member of the FAU Foundation’s True Blue Circle. Accepting the Faculty Talon Award was Frederick Bloetscher, Ph.D., who was recognized for his exceptional leadership, commitment and service to FAU students. Since 2004, Bloetscher has taught more than 30 classes and nearly 900 students; served as faculty adviser for FAU’s chapter of the American Society of Civil Engineers; and advised students’ work on a Gold LEED-certified library in Dania Beach, the design plans for the Pembroke Pines Aquifer Recharge project, and Dania Beach’s new nanofiltration plant. He has been nominated for Distinguished Teacher of the Year three times and was a finalist in 2006, and received the TIAA-CREF Faculty Service Award in 2010. The recipient of the Student Talon Award was Stephen Jones. Honored for his academic excellence and commitment to the university and community, Jones is a senior in the Harriet L. Wilkes Honors College and will receive a bachelor’s degree in economics with a minor in math in May 2013. He has served as budget chair for the FAU Student Government House of Representatives, on the Honors College’s Judicial Board, and as an officer of the Economics and Business Club. Jones received the prestigious Boren Scholarship to study abroad at University of Dar Es Salaam in Tanzania, and has interned with the U.S. Embassy in the Democratic Republic of Congo and the U.S. State Department Sudan Desk in Washington, D.C. Prior to the Talon Awards presentation, five FAU graduates were inducted into the Parliament of OWLs (Older, Wiser Leaders), the University’s alumni honor society, which recognizes outstanding former student leaders, past presidents of the FAUNAA, distinguished alumni of the colleges and Alumni Hall of Fame members. Inductees included Megan Allore, BA ’12; Michael Dalickas, BSCV ’07; Alex Lange, BA ’12; Jamie Polidora (May 2013); and Ruth Rader (December 2012). For more information about the FAU National Alumni Association, call 1-888-FAU-ALUM (328-2586) or visit www.faualumni.org.